Everyone who lusts after a job in some creative field runs into this inevitable question. When I was 10, I told my mother I was destined for Broadway. When pressed for a possible fallback, I shrugged and said I could always go into journalism. She has worried about me ever since. New York’s Chicken Specialist wouldn’t make any ordinary chicken soup. Your grandmother could whip that up. 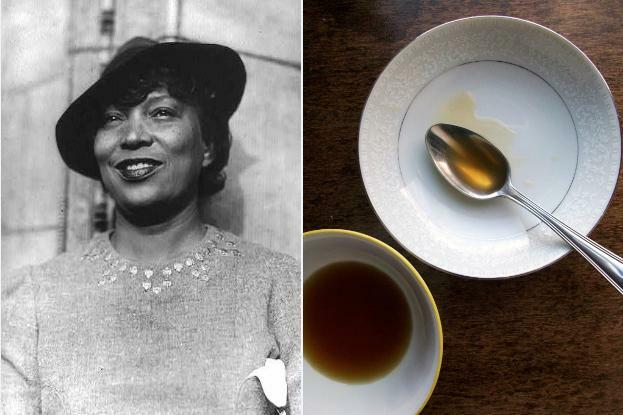 “I aim to make the soup so well that it can be served as a cold consommé or hot as clear soup,” Hurston wrote. Making consommé can be a tricky business, with an additional process that gets rid of impurities and makes the broth extra clear. But the result is more flavorful (not to mention more “refined”) than any chicken noodle, which is exactly what Hurston was banking on. 2. Chop onion, carrots, celery, and leek into a rough dice (about 1-inch cubes). In an 8- to 10-quart stock pot, heat remaining 1 tablespoon oil. Add vegetables and garlic and stir until slightly softened, about 5 minutes. 3. Add chicken carcasses to pot and cover with water, about 10 cups. Add bay leaf, thyme, peppercorns, and 2 teaspoons salt. Bring to a boil. Skim froth, then reduce heat to a simmer. Let cook uncovered 3 hours; every 30 minutes, skim froth and add water as needed to keep chicken submerged. 4. Strain stock through a fine-mesh sieve into another stock pot or large bowl, discarding solids. Skim remaining fat, then add salt to taste. 1. Roughly chop onion, leek, and carrot and put in the bowl of a food processor. Add ground meat and pulse until pureed. Stir in egg whites. 2. In a heavy saucepan, combine chicken stock and egg mixture over medium heat. Bring slowly to a boil, stirring constantly, making sure that the egg mixture doesn’t stick to the bottom or side of the pan; it will begin to form a “raft” floating on top of the stock. 3. Once the stock has reached a boil, stop stirring and lower heat. Make a hole in the middle of the raft big enough for a ladle or large spoon and let simmer 20 minutes. 4. Line a fine-mesh strainer with cheesecloth. Through the hole in the raft, ladle the broth into the strainer over a large bowl or saucepan. Discard raft. Garnish with whatever you like (I used chives and mushrooms) and serve either hot or cool (not cold, as it will form a gel). Zora is my fave author, hands down! Love, love her writing. I’ll have to look into this come holiday season for the fam. Great piece! I am currently completing a book on Zora through the Lens of Food. You would probably enjoy the stories I have done on literary figures on my blog foodasalens.com such as Langston Hughes, James Weldon Johnson, Ralph Ellison and others.